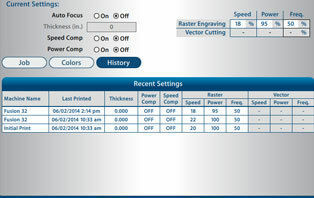 The Epilog Job Manager is a powerful new tool that will quickly become one of your favorite features on your laser system. 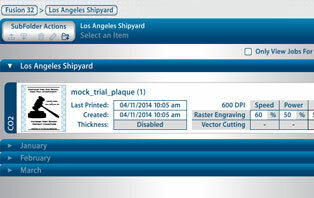 From one piece of software, you can access any job you have sent to the laser, view the settings you used on any past job, re-run projects, access your material database, and much more. It’s a great addition to the Epilog Laser product features, and we look forward to seeing how our customers use this software! Now available for the Epilog Zing, Mini, Helix, EXT, FiberMark and Fusion Systems! Whether you are using one laser or multiple lasers from across our product line, you can set them all up in the Job Manager. 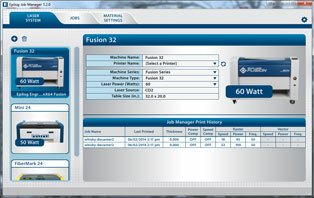 Send a job to any of your available machines at the touch of a button. And since you can network our lasers through the Ethernet connection on every laser, you'll be able to easily set up multiple machines from one computer. Remember that job you ran three months ago for Jennings Windows & Doors? No? With the Epilog Job Manager you can pull up the job and the settings you used to get the perfect engraving! 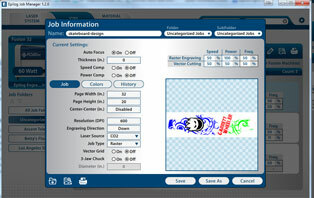 Send jobs again by pulling up any job, adjusting the settings directly from the Job Manager software, and printing. 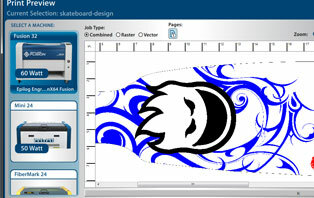 You can also still send the jobs directly from your favorite design software. Setup custom folders for your most common customers to easily access their jobs. Create subfolders by month, year, or any other category that is most helpful to you. Material settings based on your wattage of laser will be automatically loaded into the system so you can import them into any laser job. You can also setup your own custom settings based on the specific materials you use most often. Zoom in and preview every pixel of every job. 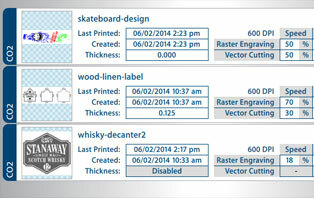 Double click the preview window to review and edit laser parameters and print from the preview screen. Look back at every time that a job has been sent to a laser. 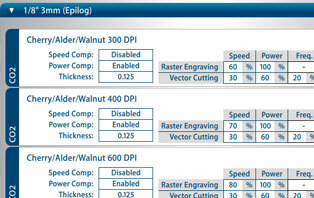 You can also see the different settings you used for each engraving. This is especially helpful when trying to find the perfect setting you used for a previous job. 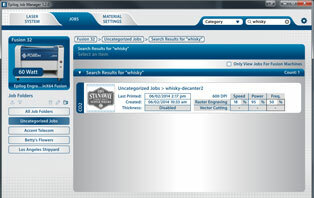 The Epilog Job Manager features a powerful search function. Type in part of a file name and press enter to find all files related to that name. You can organize files by category, creation date, print date, or alphabetically to find a specific file. We've even made it easy for you to keep your files organized. Any uncategorized files that you don't want to keep in the database can be cleared from the database memory at the touch of a button! Available exclusively on Epilog Laser Systems. For more information, fill out our brochure and sample kit request form. 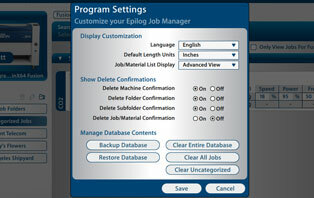 To download the Job Manager, visit the driver downloads page. Please send me info on the Epilog Job Manager.